I love that I can call my hairdresser a friend. 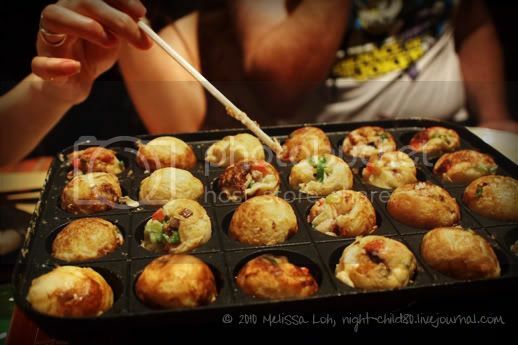 We've been saying we should do a takoyaki night, but never got round to it due to calendar clashes. However, we finally set a date and she invited us over for takoyaki at her place over the weekend. She proudly pulled out this non-stick cast iron takoyaki plate and I am in awe! These were awesomely yummy with proper octopus and once we got the hot plate going, they got better and better. I now have the receipe to make these, as long as I can get the mould. And I want one sooooo bad now. Searches on Amazon, eBay and Rinkya aren't proving too successful. We might have to wait till our next trip to Japan. Does anyone have any idea where to pick one up without it costing an arm and a leg? Thank you a brilliant dinner and even better company, Yumi! Ah that's awesome. You bring me fond memories of japan; we indeed had a takoyaki night and they had this awesome iron set too.. There's just something about the iron set that makes it feel so authentic, hey. I don't know about a cast iron set, I'm afraid. The one on j-list (someone said), which is an electronic one, appears to be similar to a poffertjes maker as well, which was sold at Aldi's a while ago. you might have some luck with myers for a dutch pancake maker that has deep enough "wells". however, a cast iron one would be ssoo much better! My hairdresser warned against the electric ones, cuz she set one on fire while using it before. Don't know how. I'll take her word for it. I'm not surprised. Looks like the only way to get it might be to lug it back in a suitcase since shipping for such a heavy item is crazy. *LOL* If and when we next travel to Japan.